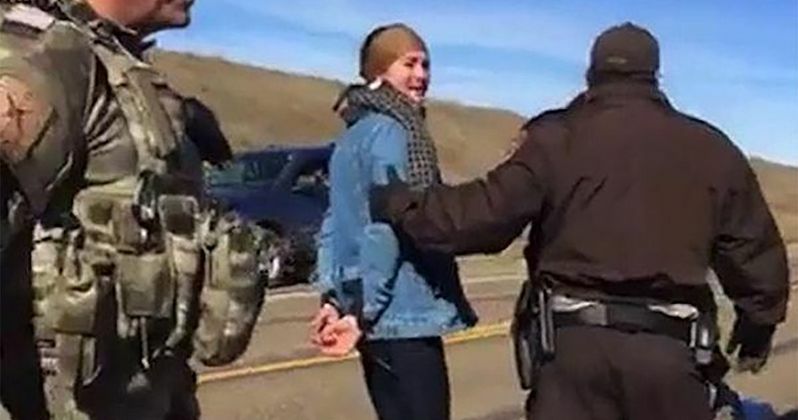 Shailene Woodley, star of the Divergent young adult film franchise, was placed under arrest today in Sioux County, South Dakota under the charge of criminal trespassing. The actress and longtime activist was part of a peaceful protest against the Dakota Access pipeline. The actress was live-streaming video of the event on Facebook Live, before she was taken away by the authorities. The Dakota Access Pipeline has become quite the hot-button issue as of late, with protesters trying to stop a pipeline from cutting through the Standing Rock Sioux land and burial grounds. The Justice League cast recently threw their support behind the "Rezpect Our Water" movement that is protesting the pipeline. On Sunday, a Federal appeals court rejected a request to stop construction, which lead to this protest earlier today. The actress had posted a video that is more than two hours long, at the end of which you can see the authorities placing her under arrest. Here's what she had to say in part of her video. "I don't know if you guys just heard me, but I was walking back to my RV, which is right there so that we can go back to camp peacefully and they grabbed me by my jacket and said that I was not allowed to continue. And they had giant guns and batons and zip ties and they're not letting me go." One unidentified police officer then said she was being placed under arrest for criminal trespassing, which lead the actress to ask why she was being arrested and not everyone else, speculating that it is "because I'm well known" and because "I have 40,000 people watching." It hasn't been confirmed if the actress has been released or not, or if the authorities plan to keep her in custody overnight. While we wait for more updates, take a look at the brief video featuring Shailene Woodley's arrest, along with her full two-hour video from Facebook live.